Butterfly Reflections, Ink. : Beary Happy Birthday!! 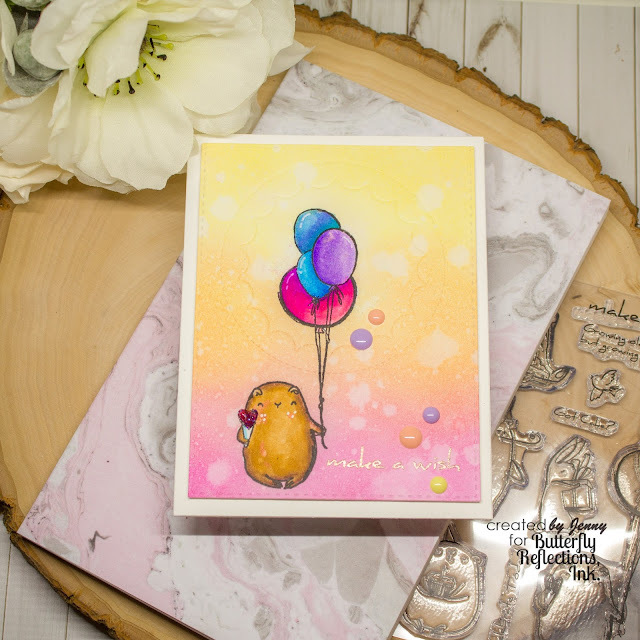 It's Jenny here with a cute Birthday card to share using the amazingly cute and cuddly Brutus Monroe Birthday Bears. To create the card, I stamped the Bear with the balloons in Versafine Onyx Black ink onto some smooth Bristol cardstock. I then colored him in with some waterbased markers (Zig Clean Color Real Brush Markers). I wanted to do some ink blending over the top but he was too fiddly to fussy cut a mask for, so I used some Rubber Cement and just painted it straight over the top. Once dry (just a few minutes), I blended Distress Ink in Picked Raspberry and Squeezed Lemonade top to bottom. A few sprinkles of water and boom! awesome background :) To remove the rubber cement, just gentle rub with your finger and it rolls right off. I die cut the piece out with a stitched frame die, and then for a bit of fun, I decided to emboss a die by My Favorite Things (Peekaboo Jumbo Circle) using my big shot, a Texture pad and a silicon mat. 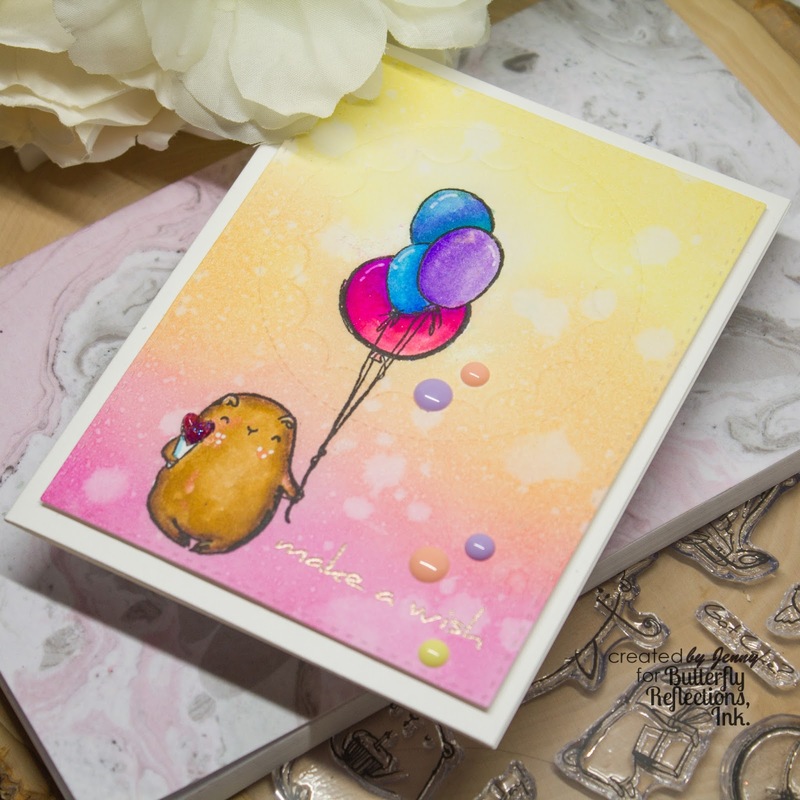 Instead of cutting the paper, it embosses it - a great way to stretch your dies! To finish, I embossed a sentiment from the same set in Wow! Rose Gold embossing powder, and then popped the piece up onto a white card base. A few scattered enamel dots and some Wink of Stella on the balloons and Pink Stickles on the bunch of flowers finishes it off!! So cute this set! I will definitely be using it again for kid's birthdays! Oh, it’s so sweet. Love the background. That is such a lovely card ! That bear is truly irresistible ! !